Before the ‘Beast from the East’ strikes | A balanced diet . . .
Friday 23 February. A bright, sunny day, and not too much of a breeze. Although the day dawned with a covering of frost everywhere, it was not as cold as I feared. Still, there was a need to wrap up warm. It looks like things will be rather different next week when the Beast from the East hits the UK. Beast from the East? That’s what the weather system from deepest Siberia has been labeled, and due to hit the UK early in the week, with Arctic sub-zero temperatures, and possibly significant snow fall. There’s a more or less stationary high pressure system over Scandinavia to the northeast of the UK, blocking ‘warmer’ weather systems driving in from the Atlantic, and at the same time drawing in all that cold Siberian air on a strengthening easterly air flow. So, with much more inclement weather forecast, Steph and I decided that we’d better take advantage of yesterday’s decent weather and head out for a walk, and visit yet another National Trust property: Knowles Mill, a derelict 18th century flour mill alongside Dowles Brook in the heart of the Wyre Forest on the outskirts of Bewdley, about 18 miles west from Bromsgrove. 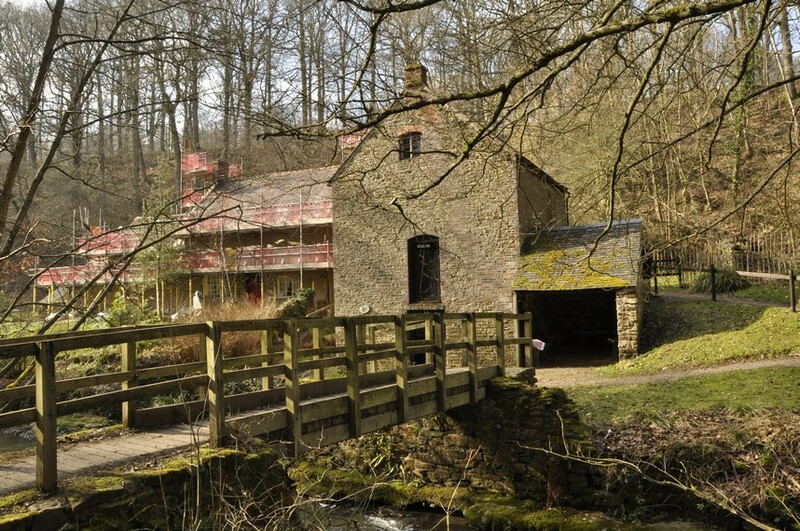 Knowles Mill along Dowles Brook in the Wyre Forest, with the mill cottage (privately-owned and undergoing renovation) behind. 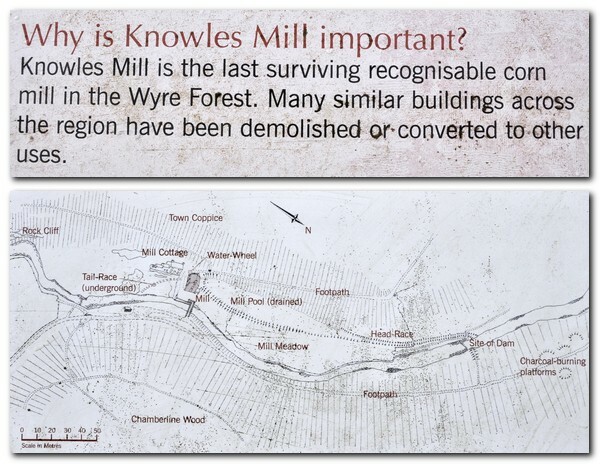 There are no National Trust signs to Knowles Mill. 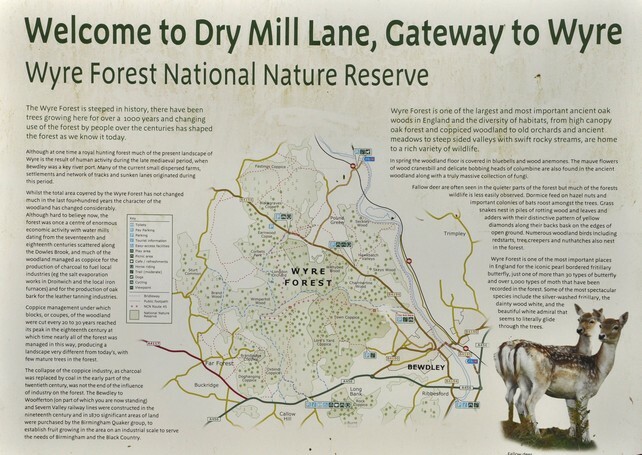 It’s located within the Wyre Forest National Nature Reserve, and parking (with space for up to a dozen cars) can be found at the end of the very narrow Dry Mill Lane. We arrived around 10:20, and took one of the remaining spaces. Best to get there early although by the time we departed, just after noon, many of the cars had already left. As with all my blog posts, just click on the images to open a larger version. We decided to follow the Dowles Brook Trail (marked red on the map below), although there is a public bridleway on the other side of the brook, and a bridge over it at Knowles Mill. 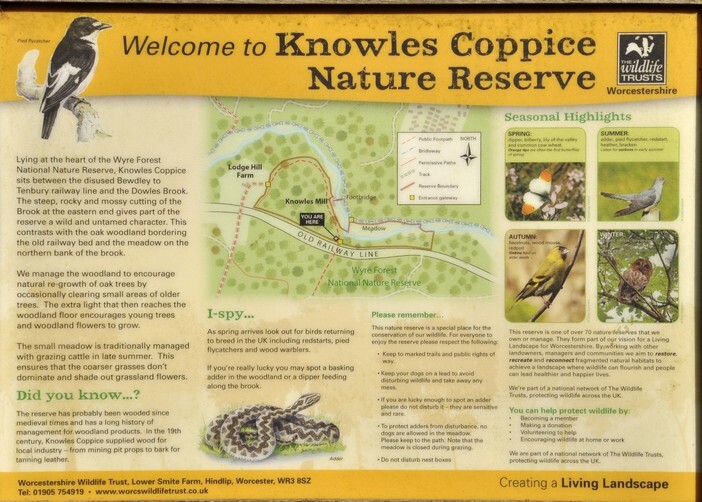 This route initially follows the Wyre Forest Butterfly Trail along the bed of the disused Tenbury and Bewdley Railway that was opened in 1864, and closed in July 1961. Then there’s a steep walk down into the valley, with the path emerging behind the mill and cottage. 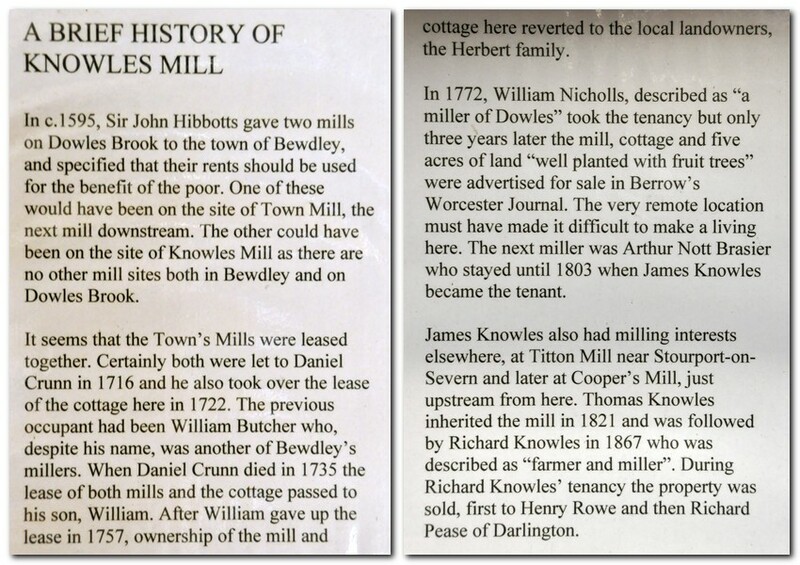 So what was a mill doing beside Dowles Brook, how long had it been there, and what was its history? The millstones and gearing mechanisms inside the mill are still in quite good shape. On the west side of the mill the skeleton of the water wheel can be seen, and beside that the drained mill pond (although with some standing water today). 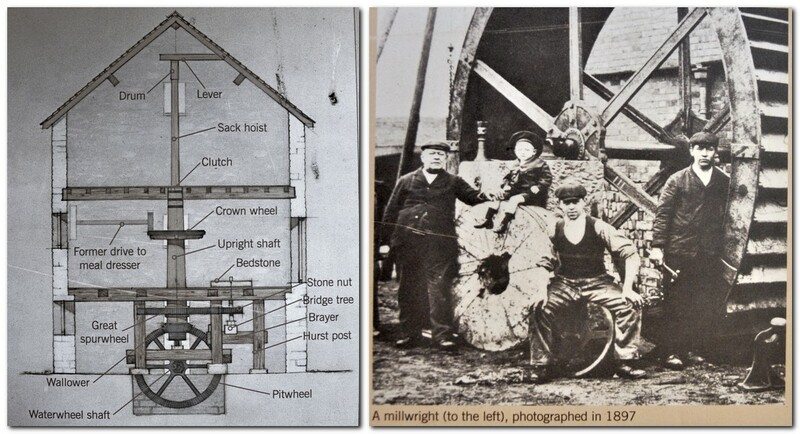 I couldn’t help wondering how life at the mill must have changed once construction of the railway began in 1860. The peace and tranquility of the site must have been shattered as the gangs of navvies moved in to build the massive embankments across all the small valleys that cut through the hillside above Dowles Brook. After visiting the mill, we headed upstream, passing Cooper’s Mill (just a cottage now) before crossing over Dowles Brook and returning to the car park along the disused railway. At the car park we enjoyed a hot cup of coffee (we’d brought a flask with us) before setting off home in time for a later than usual lunch. 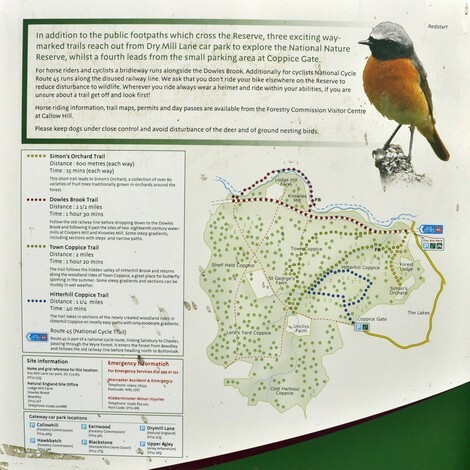 The walk, just on three miles, had no challenging sections to speak of, and combined the best of both worlds: local history and the enjoyment of beautiful woodland landscapes. Note: there are no toilets at the car park. 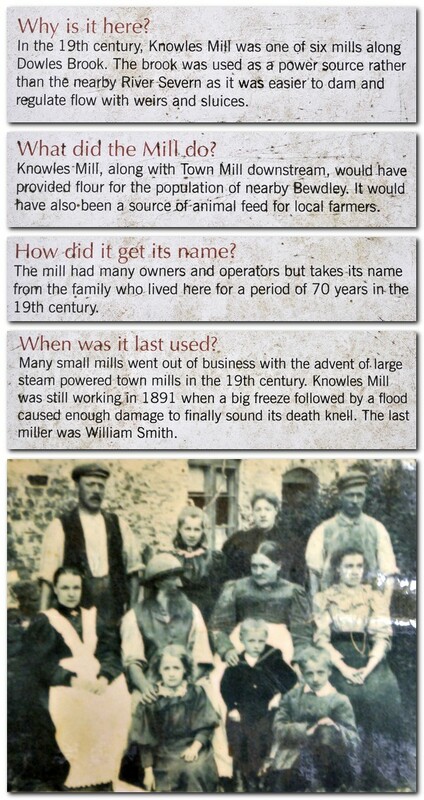 This entry was posted in Out and about, Travel and tagged Knowles Mill, National Trust, Worcestershire, Wyre Forest.